I was recently lucky enough to have the opportunity to go paintballing for a friends birthday. Google maps got a bit confused when we were trying to make our way out there and I had to resort to stopping and asking for directions, but it turned out to be pretty easy to find even though it was in the middle of nowhere. 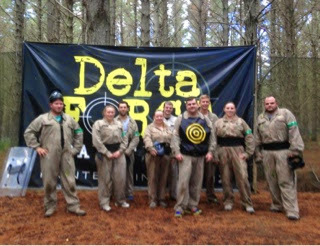 Once we arrived we had a short briefing on how the day is run and had an opportunity to order a pizza for lunch in advance, upgrade our paintball guns and purchase other additional items. After this we signed some legal waiver, got some numbers written on our hands and then got giving our overalls, padding and helmet in a very army movie kind of way - it was pretty cool. The first 2 games we played was a capture the flag game and it was set in a large sloping area with a small pyramid in it that housed the flags. I had helmet fog issues in the first game and then in the second game I got shot on the elbow, shoulder and left buttock. I had some spectacular bruises! 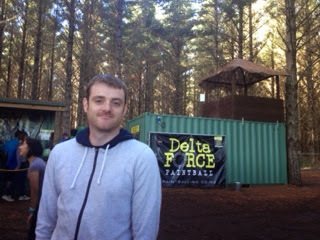 The next 2 games we played were set in an area with a small fenced off compound that had 2 cabins and lookout tower in it - the aim of the game was to capture and hold one or both cabins. My dear husband who had got shot and passed me on his way to respawn told me the coast was clear so I ran full speed into a stomach shot at less than 3 meters - the good news is that the padded vest took the brunt of it so it didn't really hurt. We could have spent the whole day there, but the cost of ammo and refreshments would have made for a fairly expensive day so once we had used up about 2000 paint balls each we called it a day. A good time was had by all.